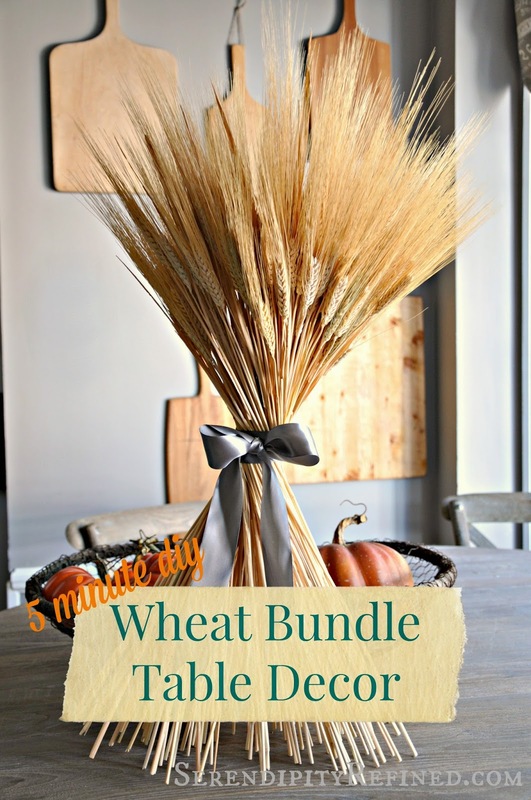 One 4-6 inch diameter bunch of natural wheat from the hobby store, florist, farmers market, pumpkin patch or Internet store. (or from a wheat field located about 20 minutes from your home that hasn't been harvested yet that you happen to know of from your days driving a combine during college.) Seriously, when ever possible please ask permission from the person who owns the field before removing wheat, corn stalks, soy or anything else that doesn't belong to you. I don't want to encourage anyone to get into trouble over a centerpiece! One large rubber band. Generally found in the bottom of the junk drawer probably left over from the 1960's when newspapers were still delivered, with rubber bands around them, by children riding bicycles. I'm not kidding...that used to happen...not that I'm old enough to remember it. Sharp scissors (Any type that are NOT the sewing scissors). 1 yard of 1 1/2 inch wide gray satin ribbon (or burlap or jute twine or a piece of vintage lace or anything else that you think might look nice as you're standing (in your nightgown with bare feet) on the cold tile floor of the unheated mudroom where it's 42 degrees at 5:30 in the morning trying to decide what to use). Briefly consider that it's going to be a long, cold winter. Decide that you should probably find your gloves and winter jacket soon. Get dressed (Optional unless you're going to be taking a photograph of your arm to publish on the Internet for the tutorial you're writing). Loosely line up the tops of the pieces of wheat. Grab the wheat in your hand. Snap optional photograph feeling particularly pleased that you chose an appropriately fall colored orange thermal shirt to wear today. 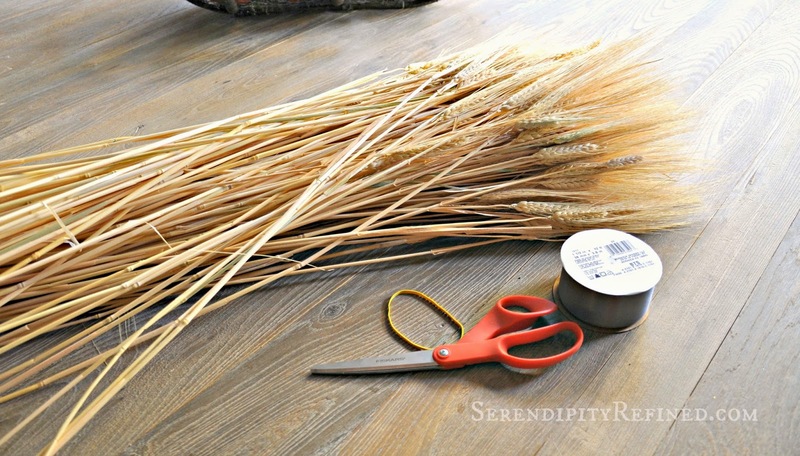 Wrap a rubber band tightly around the wheat about three inches below the heads. This is easier if you have someone to help you. Note: yellow labs are not particularly helpful for these types of projects. I attribute it more to the fact that dogs lack of thumbs than any real unwillingness on their part. If you have no assistance, use your hands, feet, teeth, and back of the chair to accomplish this task. Cut the bottoms of the wheat even. Give the bunch a slight twist. 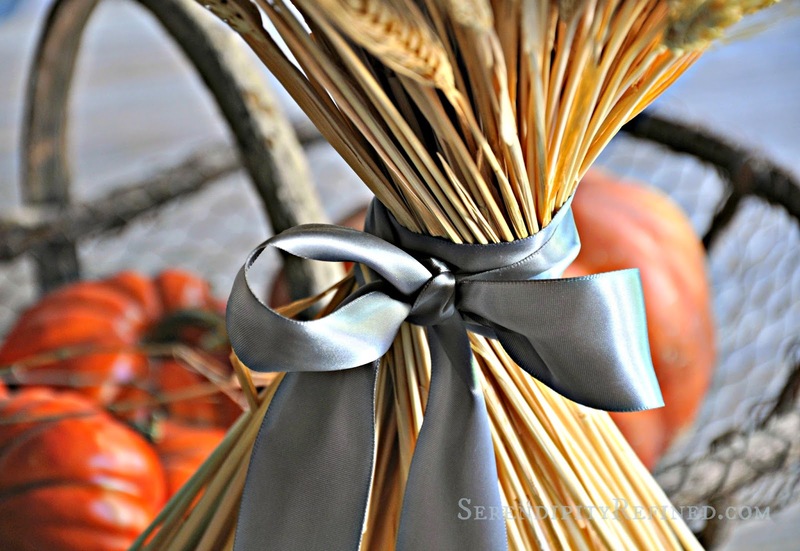 Wrap a piece of ribbon around the bunch to cover the rubber band. 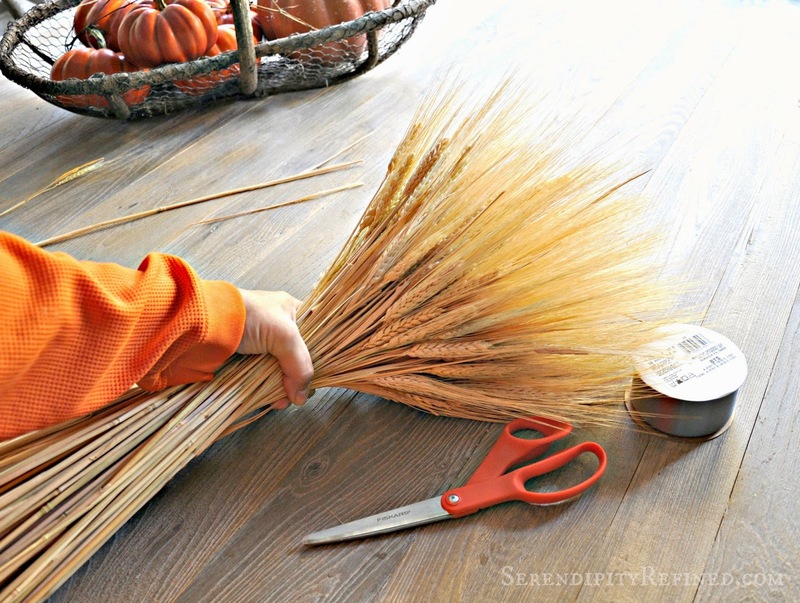 Fan out the bottom slightly and stand the wheat bundle in the center of your table. Stare in amazement that it actually stands upright! 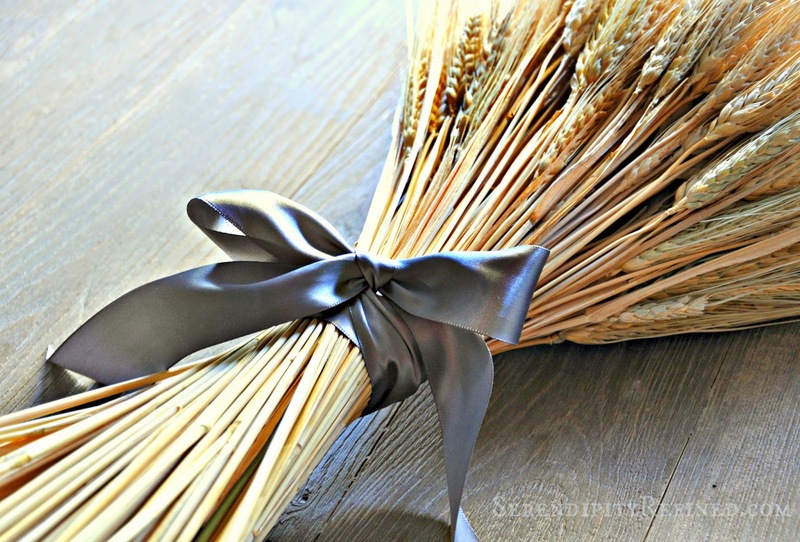 Look, I've seen these wheat bundles (known as wheat shocks for those of us who like to know the correct terms for things even though we'll never use them in normal conversation) for sale in stores and in online in photographs. I always wondered how they made them stand up. Today I found out that there's really no magic to making that happen. ....and fanning the stems.....I'm convinced that stem fanning is the key to the whole project. 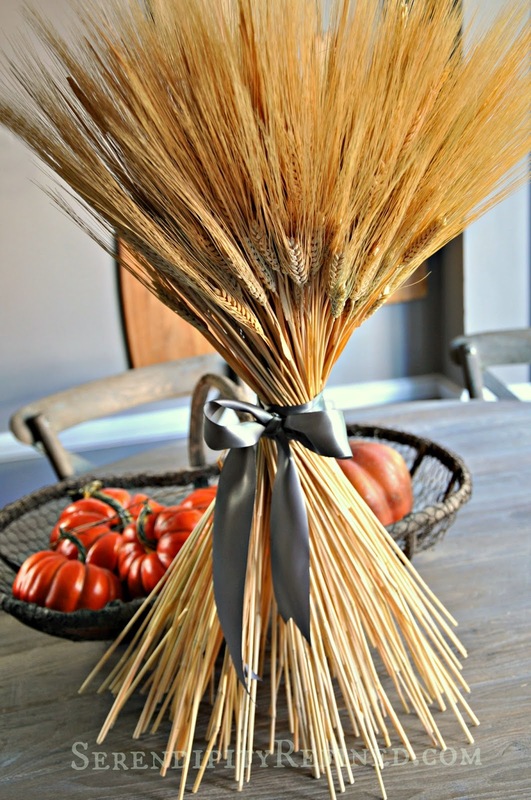 I hope that you make one of these super easy DIY wheat bundle table decorations for your fall table. 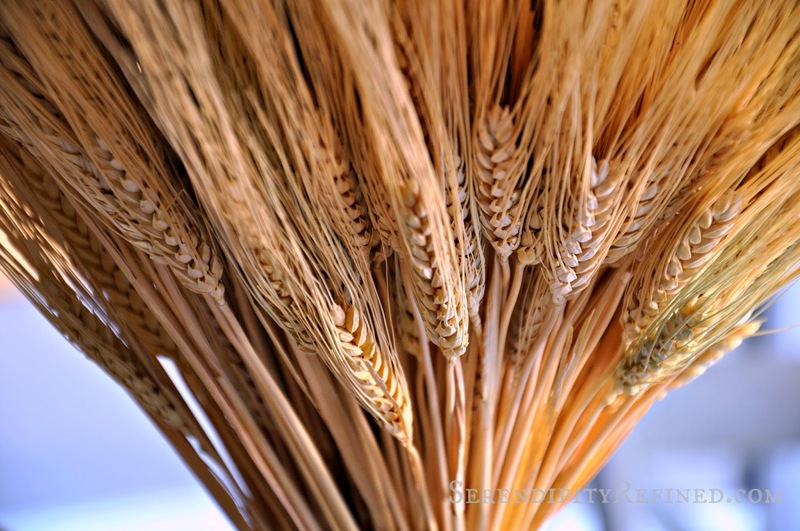 Natural wheat is readily available in most parts of the U.S at this time of year and on the Internet and Etsy as well. 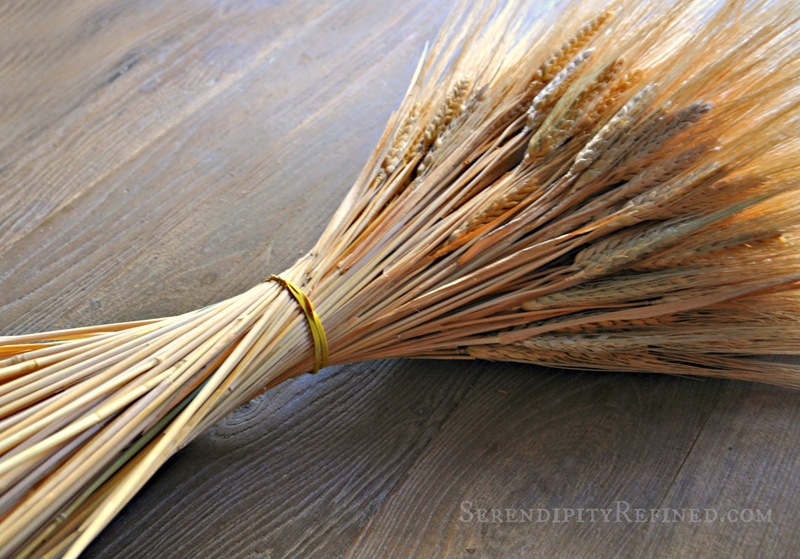 As always, if you gather natural wheat from a field, be sure to bake it in the oven at 200 degrees for 20 to 30 minutes before using it to ensure that it's dry and there are no creepy crawlies living in it.